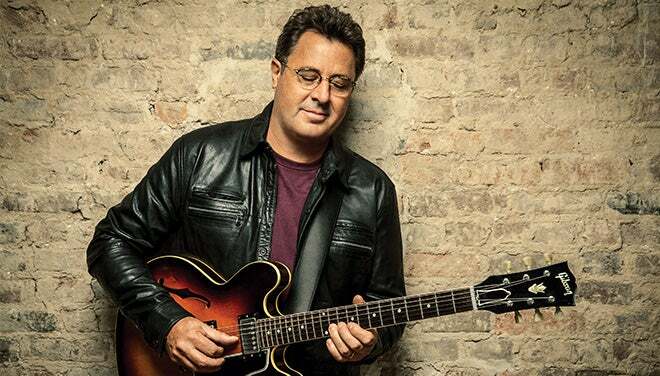 Country music star Vince Gill will play the Peace Center on Wednesday, Sept. 26, at 7:30 p.m.
Gill achieved his big breakthrough in 1990 with “When I Call Your Name,” which won both the Country Music Association’s Single and Song of the Year awards as well as a Grammy® Award. He has won 21 Grammys – the most of any male country artist – and 18 CMA Awards, including Song of the Year four times – making him the most awarded artist in that category in CMA history. Gill was inducted into the Country Music Hall of Fame in 2007 and is a member of the Grand Ole Opry. In 2012, he was honored with a star on the Hollywood Walk of Fame. He is member of the six-time Grammy-winning band The Time Jumper and has made guest appearances on more than 500 albums, including on those by Barbra Streisand, Eric Clapton, Willie Nelson, Dolly Parton and George Jones. Combining a deep knowledge of Americana, bluegrass and classic country with the fire of 1960s rock, Gill has established himself as one of the most successful artists of his generation. Tickets for the Wednesday, Sept. 26, 7:30 p.m. performance by Vince Gill are $55-$85 and may be purchased by calling 864.467.3000 or 800.888.7768, in person at the Peace Center Box Office or online at www.peacecenter.org. Tickets go on sale to Peacekeepers beginning now and go on sale to the public on Friday, Aug. 3, at 10 a.m. Handling fees will apply to phone and online sales.